Shorter bus waits, faster bus trips and better transit connections. That’s what riders and the public told us they wanted and needed. Now, Metro Transit is asking riders and the public for final feedback on the nearly completed draft of the Metro Reimagined plan, which will impact MetroBus routes in the City of St. Louis and in St. Louis County. Learn more: Find out what changes are in store for your MetroBus route. Over the past 18 months, Metro Transit received input from the public, riders, community groups and elected officials and incorporated that feedback into the new MetroBus network plan. The Metro Reimagined network plan offers faster, more frequent MetroBus service. It is a new vision for public mobility in the bi-state area, expanding Metro’s role from a transportation provider to a convener of services that improve access to economic prosperity and enhanced quality of life. The changes will be made utilizing the existing funding allocations. Q&A: Check out the most commonly-asked questions about Metro Reimagined. We encourage you to attend any of the upcoming informational meetings at Metro Transit Centers, where there will be opportunities to speak with a transit planner, ask questions and share feedback. Stop by one of our upcoming Information Sessions to speak with a Metro Transit Planner, ask questions and learn more about the new plan. Feedback to the plan can also be shared with Metro Transit Customer Service by calling 314-982-1406 or texting 314-207-9786 from 7 a.m. to 6 p.m. Monday through Friday or emailing customerservice@metrostlouis.org. 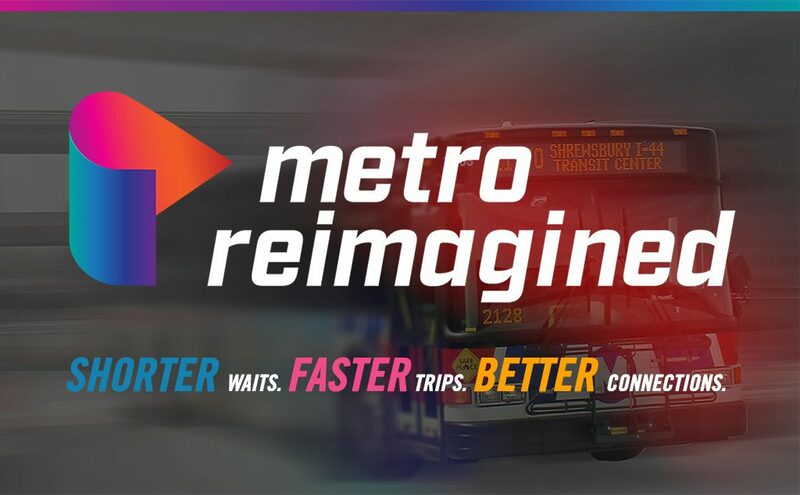 Metro launched Metro Reimagined, a comprehensive analysis of the MetroBus system, in July 2017 to ensure that Metro is positioned to meet the evolving transportation needs of the St. Louis region, today and in the future. The project team will incorporate community feedback into the final revision of the Metro Reimagined plan in late 2018. Metro Transit hopes to begin alternative mobility type pilot projects starting in spring of 2019 and implement the changes to the fixed-route network in fall of 2019. Will express bus routes transition to using alternative vehicles from standard buses? At the least, express busses need to look very different from standard buses since it is very common for local route riders to mistakenly get on express routes and end up hours away from where they wanted to go. If the same busses are used, signage inside the bus or automated announcements could at least remind people what route this is. Jonathan, the proposed Metro Reimagined draft plan will work in tandem with a new marketing/brand roll out. This could mean different branding on different levels of MetroBus service, including express service. Hey Matt. I was at the Ballas Transit Center and I have seen videos of the new MCI D45 CRT LE. I am not sure if you remember the old 3000 class buses which were the Neoplan Metroliners or not. When we bought those things, some of the riders liked them since they rode smoothly. But some did ride a little rough compared to an MCI bus. MCI made one good bus which was the MC-8 (MCI Crusader) and they made them as MC-8s, MC-9s and MC-12s. The dash is almost designed similar to the ones on the Gillig Advantage but it has a manual door control. Sadly thanks to the severity of the ADA, that bus was discontinued from production. If they could bring back an MC-9 but in the form of the LE (low-entry) I think would come thru with flying colors. The thing that I don’t like about any of the over-the-road type of commuter buses that other transit agencies has bought is that they all come with plug doors. The Neoplan Metroliners had them and so did the Orion IIs. Plug doors has a history of being troublesome due to constant weather changes. Super interesting Patrick. Thanks for sharing! I ride the bus every day. All of the updates sound great. But, if they really want to make the trips better they need to go back the the basics too. (No eating, drinking, or loud music and of course the fowl language). Some riding are just pigs, leaving garbage all over the bus. And the language even when kids are riding. I’ve even seen people selling merchandise(probably stolen) and bus tickets during the ride.The driver has to know this is going and should remove them from the bus. Some of those selling tickets have a whole business going on in the back row. I have personally seen it in multiple occasions. Jerry, thank you for providing your feedback and your experience on board Metro Transit. The main responsibility of the bus operator is to transport riders safely and efficiently to their destinations. It is up to Metro Public Safety as well as our police partners to patrol and secure the transit system. Metro employs transit authority officers; and Metro employs contract security to provide front-line security and fare enforcement. The region, through the leadership of East-West Gateway Council of Governments, is conducting a MetroLink Security Assessment, scheduled to be completed this year. We anticipate that this assessment will include recommendations for operational and physical strategies to enhance transit system security. Stay tuned to that conversation. I haven’t gotten a response from South County Chamber of Commerce about making a little van route. Maybe it is time that we get either you or someone in planning to get in contact with them and to keep contacting them until they respond about creating a local shuttle for that area. But kudos for restoring Sunday service on the #56. Now that will make it easier for me to get back to going to church. We’re always open to collaboration Patrick. As a BJC/ WASH U EMPLOYEE THE LAST EXPRESS BUS FROM DOWNTOWN TO NORTH COUNTY NEEDS TO BE MOVED TO AT LEAST 630 FOR ALL THE EMPLOYEES GETTING OFF AT 6 PM. 610 IS JUST NOT ENOUGH TIME TO GET THERE. THAT’S NOT REASONABLE. Becky, thank you for providing your feedback. We’ll pass it along to Customer Service. I recall there was a plan to open/extend a bus from Chesterfield to Westend (WUMS) before. Is it still possible? Yong, I’m not sure what you’re referring to. I see there’s a plan to end the 174x and replace it with the 85 going down Broadway all the way to downtown. So we replace a quick effenciet route for workers to get downtown with a slower multiple stop route, bad idea. People have been riding that bus to work for 10-13 years, now stopping it and no other express bus makes no sense whatsoever. South and West counties keep their express but North county doesn’t…looks strange. Also if there is low rider turn out for the 174, it shouldn’t have never changed from the AM runs then the PM runs. Most of your riders are folks from North county that work downtown. In the middle of the day these people are all at work. Go back to the old hours or similar and keep that route. Robin, the #174X North Express will be replaced with the #84 Halls Ferry. Under its current service structure, the 174X North Express offers 20-minute frequencies between 5 a.m. and 8 a.m., 60-minute frequencies between 8 a.m. to 4 p.m., then 30-minute frequencies between 4 p.m. and 4:30 p.m. and back to 20-minute frequencies between 4:30 p.m. and 6 p.m. Under the Metro Reimagined draft proposal, which deviates a little from its current route, the #85 Halls Ferry will offer 30-minute frequencies throughout most of the day (4 a.m. to 7 p.m.). That being said, I’ll make sure your feedback is sent to Customer Service to be included in the overall draft process. Thank you Robin for your time. I agree, the 174x should be a true express route for those living in North County and working downtown. It feels more like local route when it has to travel miles up a busy street such as Broadway, W. Florissant, etc. If you want working people with their own mode of transportation to ride metro, you have to make the commutes shorter and safer. I am hearing that you are taking the 174X that’s get us to work pretty fast. Is this true? Also, when do this suppose to rake place? Sandy, under the Metro Reimagined draft proposal, the #174X North Express will be replaced with the #84 Halls Ferry. This route will over 30-minute frequencies between 4 a.m. and 7 p.m. We expect to roll out these enhancements via a phased in approach, starting sometime later next year. Hi, living in Chesterfield, is there a bus route on Clarkson/Baxter to Manchester? Or Clarkson/Baxter to Clayton Rd? Deb, the 157X Twin Oaks Express serves the intersection of Baxter Road and Clarkson Road. This route begins at the Chesterfield Mall and terminates in downtown St. Louis, serving the Central West End, Webster Groves, St. Louis Community College – Meramec, and a portion of Manchester near the intersection of Kiefer Creek Road. Under the Metro Reimagined plan, this route would function as an express route, operating 30-minute service during morning rush (5:30 a.m. to 6:30 a.m.) and evening rush (4 p.m. to 5 p.m.). I ride the 410X Eureka Express. I noticed the proposed 10X route will no longer service the Civic Center area of downtown. As a federal employee, I ride the bus with several others in both the morning and afternoon. Why would Metro change the route away from a popular bus stop at Spruce or at least the Civic Center Transit Terminal? Wells Fargo is another popular stop for riders. Since the route no longer carries people down Grand and other loops, why not swing down Tucker or Truman toward the Civic Center? Also, several riders remarked that the change in hours will impact their ridership. Some people take the earliest buses to ensure they arrive to work in time with various transfers. People also cannot work later than 5:30 in the event they get marooned downtown. Stefanie, you are correct. The #410X Eureka Express will be replaced by the new #10 Eureka Express. Under the Metro Reimagined draft plan, the #10X Eureka Express will offer express service from Six Flags to downtown St. Louis with 30 minute frequencies from 5 a.m. to 7 a.m. and 3 p.m. to 5 p.m. during the weekday. Under the new plan, the #10X will not serve the Civic Center Transit Center; however, it will serve the Central West End Transit Center. As this is a draft proposal, there may be room for modifications. I’ll make sure your feedback is sent to Customer Service to be included in the planning process. Thank you Stefanie for sharing your feedback with us. Is the #3 forest park trolley being discontinued? I’ve noticed you’ve also gotten rid of service for the botanical gardens. I’m concerned as a disabled person who’s only way of getting around is the metro. Particularly in uneven places such as forest park. Though in general I don’t think cutting service to public parks is a good idea or fair to those who depend on metro service. I work at WashU and currently I take 58X bus commuting. It seems that the new 157X bus will take us directly to WashU medical school. That is fantastic! I wonder when this new plan will start? Yvonne, woo! It IS fantastic. We plan to roll out these changes through a phased-in approach, starting sometime late next year. Now Matt, with the current route using just the #48 and the #58 or #98, it would take me about 30 to 40 minutes. Under the new route going via Lindbergh, over the highway out to Ballas, and then picking up either the #65 or the #98, what would be the new estimated time? Hmm, good question Patrick — exact times haven’t been flushed out yet. Keep in mind this is still considered a draft proposal — things can change. You can piece together the length of your trip via the proposed frequencies of each line. For example, the #50 Lindbergh is planned to have 30-minute frequencies from 4 a.m. to 7 p.m. during the weekday. The #58 Clayton-Chesterfield will also have 30-minute frequencies for most of the weekday as will the #65 Outer Forty route. Again, we’re still in the planning stage. You’ll get a better understanding of more specific trip times later in the process. Is the data used to create these plans available to the public? As a Wash U student, I cannot imagine that Green Line has more ridership than the 1 Gold or the 2 Red. Bethany, you are more than welcome to reach out to our research team and request that information. Visit the Customer Care page on our website to get started. Keep in mind, the Green Line is currently served via a Metro Call-A-Ride van. This mode of transportation isn’t sufficient to handle the increased ridership we’ve seen with this service. Under the Metro Reimagined draft plan, the Green Line will be served by a MetroBus vehicle. A brief look at ridership numbers do show significant ridership growth on the #1 Gold and #2 Red routes, but also significant increases in ridership to the Green Line. Under the draft proposal, the #1 Gold and #2 Red will see 30-minute frequencies during most of the weekday, whereas the Green Line (which will be known as the #5 Green) will offer 15-minute frequencies during most of the weekday. Thank you for providing your feedback Bethany. We’ll make sure this is included in the planning process. I’ve heard that the 66 will be null and void starting next year. Please don’t take it away. There are several people that depend on that line. My suggestion is just a smaller bus maybe but you will be affecting a lot of regular riders if you do. C, under the Metro Reimagined draft proposal, the #66 Clayton-Airport route will be discounted due to low ridership. A few things to consider. We are envisioning some sort of community mobility option in the Hazelwood industrial area, which the #66 Clayton-Airport currently serves. While the type of mobility has yet to be determined, it may include the modes of transportation you’ve mentioned (i.e. smaller vehicles). Keep in the mind, while this route may discontinue, there are two routes nearby that’ll offer greater frequencies, most notably the #76 McDonnell Waterford and #77 village Sq. – N. Lindbergh. Additionally, this is still considered a draft plan and modifications could be made. We encourage you to reach out to Customer Service with specifics pertaining to your transit trip. What does this mean for us drivers and the future of Metro Bus. This seems to be a way of phasing out Metro Bus in the long run. Bor, Metro Reimagined is an opportunity to shift gears to better meet the current mobility marketplace. We need to adapt so we can provide riders with services that meet their travel needs. In recent years, MetroBus ridership has been on the decline for the past several years, as is the case for most transit agencies across the country. While there are always a variety of factors that can impact this number, one thing is clear: the Metro Transit system, as it is today, could work better for the St. Louis region. MetroBus will continue to be a major asset under this draft proposal. Is there any plan to cover Hazelwood industrial park ? I take bus 35 to Campus Parkway / Anglum Rd and it seems that the closest bus stop will be 1.5 miles away ! There are several big employers here, including Boeing, usps and Amazon. Jerome, thank you for providing your thoughts regarding the Metro Reimagined draft plan. Under the proposal, the Hazelwood Industrial Park would be served by a new form of community mobility. This may or may not include on-demand services, shuttles or rideshare among other forms of mobility. This service could be delivered in partnership with the city of Hazelwood as well as from collaboration from major employers such as the ones you mention. I’m a daily rider and big fan of Metro services. I appreciate your efforts to improve. Would it be possible to provide service from the Shiloh-Scott MetroLink station to the MidAmerica Airport terminal? It’s so close, yet so impossible to use the way things are now. Gary, it’s always great to talk with a Metro Transit fan. There are lots of you! Under the Metro Reimagined draft proposal, Illinois bus service will not by considered. That being said, we are in discussions with St. Clair County Transit District to enhance bus service (albeit on a smaller scale). This may roll out around the same time we begin to roll out enhancements as part of the Metro Reimagined plan. We’ll make sure Customer Service receives your recommendations. Thank you! Angie, thank you for providing your feedback. This is considered a draft proposal. That means our Transit Planners have the opportunity to make revisions to the plan. I’ll make sure your comments are part of the planning process. Thank you. I have been riding 174X for well over 10 years. I started when it would pick-up at Flower Valley(KMART), then this route was eliminated and then once the NCTC was built, the route began there for me to catch the bus. With the new plan, 174X will be eliminated and replace with a new bus/route. Most of the people riding the bus from North County work downtown and the bus seems to get downtown in a reasonable amount of time. How will this new route be any better with the changed route? Bridgett, thank you for providing your feedback regarding the Metro Reimagined draft plan. You are correct. The #174 North Express will be replaced with the #84 Halls Ferry route. The new route will offer straighter lines, resulting in faster, more direct service. Also, we’ve noticed more and more riders are using Metro Transit outside the peak morning and evening rush hours. To address this shift, Metro Reimagined plans to offer high-frequency bus service outside peak service. For example, the #174 North Express offers high-frequency service during peak travel times, but not during off peak. Under Metro Reimagined, the #84 Halls Ferry will offer 30-minute frequencies during most of the weekday. Those are the highlights of this particular route. We’re happy to provide more specifics. Give us a call at 314-982-1406 or text us at 314-207-9786. Thank you! The Carondelet route should not run down 12th St in Soulard. The buses always seem empty, and it’s too residential; it doesn’t cross enough destinations to make it worthwhile. Should be moved to a major artery like in the first draft you revealed. Thanks for the feedback, Glen. Will forward this to our Planning Department for their review. As a frequent rider, I find eliminating the 20 run to be a bad idea because I have seen a number of people use the 20 bus along the Forder road section between South County Mall and Catalan Loop, I am concerned tat by eliminating the run it would affect my ability to get out and work or do anything since the 20 is the closest run to my residence. It would be a mistake to eliminate the 20 line as it is because it could be set to connect South County Mall to the VA hospital to Catalan Loop if it could be saved to better connect those who go to the VA hospital and the disabled community near Koch Road depend on that run to connect the area. It also connects to jobs that connect at Son County Mall. I really would like to see the 20 saved since the 17 and 46 are going to be saved in the current draft plan. Thanks for the feedback, Collin – it will be shared with our Planning team as they finalize the Reimagined plan. I take the #35 to Taussig every day and catch it going home everyday and from what i see, it looks like the proposed route will end at DePaul Hospital. That just means it will take me longer to get to and from work. William, thank you for providing your feedback regarding the Metro Reimagined draft proposal. Under the draft plan, the #35 Rock Road would see frequency increase to as low as 15 minutes during most of the day an increase from the currently 20-30 minute frequency seen today. You are correct in regards to the proposed routing of the #35 Rock Road. Under the draft proposal, the furthest west the route would go is to Natural Bridge Road. That being said, we envision the Hazelwood Industrial Park to be served by a new form of community mobility. This may or may not include on-demand services, shuttles or rideshare among other forms of mobility. We’ll iron out more details regarding this service later this year. In the meantime, I’ll make sure your thoughts are sent to Customer Service, who will include them into the planning process. Thank you. I ride the 42 Sarah everyday to go to work. I work at the loves truck stop, so how will I get to work if the bus line ends at west Florissant and fair. Travis, please reach out to our Customer Service department to voice your concern regarding the Metro Reimagined draft proposal. You can do this by emailing Customer Service at customerservice@metrostlouis.org.